Donald Trump, 2016 candidate and natural communicator, was born a small child at Jamaica Hospital in Queens, New York on June 14, 1946 at 10:54 am, with royal star Regulus rising over his 29Leo57 Ascendant along with warrior planet Mars in showy Leo. Born during a Hour of Jupiter, planet of money, corporatism, and proselytizing, Mr. Trump's horoscope shows a stationary Jupiter about to turn Direct in 3 hours 11 minutes @17Lib27:07 (enlarge chart to read my notes if you wish--no time today to fully discuss the chart so perhaps I shall return another day to complete my notes for you!) 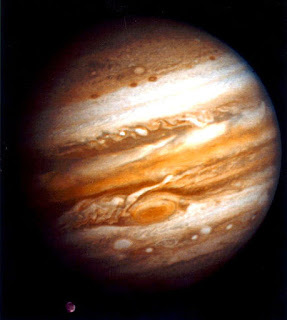 Natal Jupiter is within one degree of America's Secondary Progressed (SP) Mars, the warrior, which turned retrograde by progression in Summer 2006. Washington's military over-expansion 'broke' it. 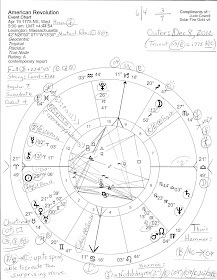 Quick Notes: Chart-ruler = Sun, and the only applying aspect by natal Sun in communicating, commerce-loving Gemini is a sextile to natal Mars in Sun-ruled Leo and this egoistic indicator points to one who is provocative, quarrelsome, and who may have a chip on his shoulder. An avid sports fan, this aspect describes an integral part of Trump's solar nature (being the closest aspect to his Sun) and underscores that he is a warrior always ready--or spoiling--for a fight. We've seen this tendency regularly from Mr. Trump through the years and no less so during his current bid for the Republican nomination for president as he stands up for his beliefs and lets the chips fall wherever. For while he's playing 'the hero' for America he is possibly a red herring candidate on behalf of another politician, party, or group of backers and we see that disruptive radical Uranus @17Gem53 (10th house) acts as the leading planet of a Bowl pattern. Doh! 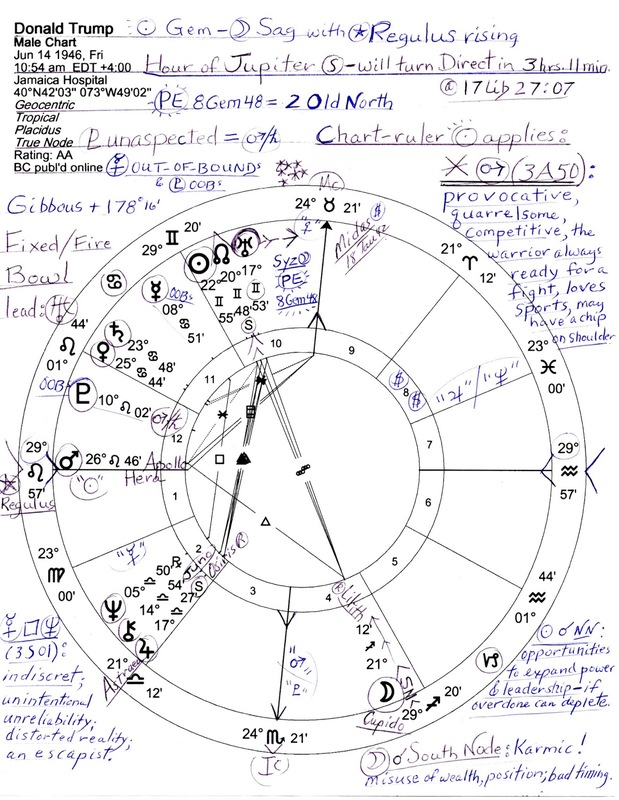 If you enlarge the chart please pardon my 'indiscret' which should read 'indiscreet' for his Mercury-Neptune square! A Bowl pattern or shape emphasizes hemispheric influences with the rim of Mr. Trump's Bowl the opposition between Uranus and the Moon @21Sag12 conjunct South Node, a karmic indicator of bad timing and previous abuse or misuse of wealth, power, and position. However, his up-and-down financial achievements are seen by a Sun-North Node conjunction on the other end of the Nodal Axis. Yet there is disruptive planet of shock and separation, Uranus, conjunct natal Sun which gives a maverick quality to his personality. Some see him as an original, inventive, genius and I unwillingly admit that he is--as long as he's following his solar direction and not letting the emotional difficulties found at Moon-SN take over his presentation. But what are the chances? And yes, early troubles with parents are suggested by the Sun-NN, Moon-SN combination and even the popularity-inducing Sun-NN duo can cause problems if expansion, self-promotion, and over promising are carried too far. As you know, depletion of resources and bankruptcy has resulted for this boasting billionaire. So with speech maker Mercury @8Can51 out-of-bounds (like some of his remarks criticizing others) we turn attention to his Mercury-Neptune square which is separating and thus unconscious. Perhaps Mr. Trump doesn't realize his Mercurial opinions often spring from his unconscious mind and spotlight a distortion of reality along with the square's tendency toward indiscretion and unintentional unreliability. Mercury square Neptune tends to identify an escape artist and he's usually able to escape the problems he brings on himself. 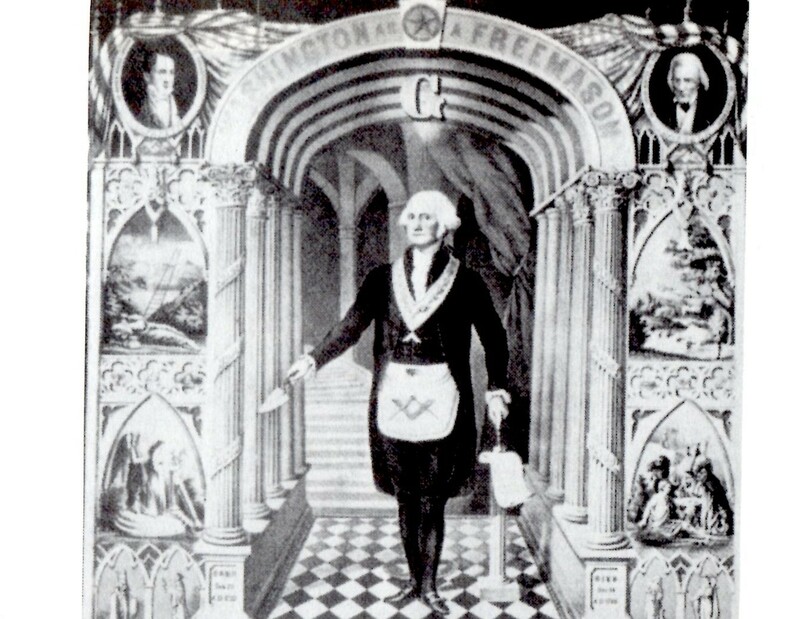 And of course, the speculator-grand-schemer pair of Jupiter and Neptune are in a money house, the 2nd of Values and Earning Power, along with Chiron which some say relates to money and wealth, too. As a deal maker, his Mercury in savvy, business minded Cancer shouts his prowess at every opportunity and provides us with boastful touts of The Art of the Deal, his bestselling book. Then with shady Pisces on the 8th cusp of Big Finance, Shared Resources, Credit and Debt, we find the magic touch of the Jupiter-Neptune influencing him as he speculates in real estate and the stock market--a perfect combination for what is essentially a 'used car salesman' type of personality, his Mercury-Neptune aspect included. Yes, Donald Trump is actually a fascinating person to study even though I attempted to ignore his 2016 candidacy until being recently asked about his horoscope and his chances by a couple of people. There are several more chart factors of interest yet as I said, no time for all that now. 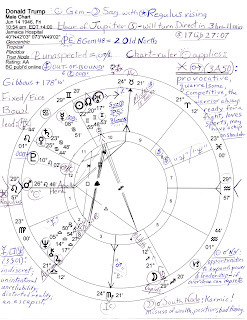 But I have taken a quick peek at his planetary links to the November 8, 2016 chart and to my surprise, there are significant connections and possibilities for him. But since this weekend he really 'stepped in it' by criticizing a Republican war hero, Senator John McCain, so this indiscretion may be the final over-the-line moment for the 2016 candidacy of Mr. Donald Trump who has made several careers out of breaking taboos and committing faux-pas no-nos. A non-server passing judgment on POW John McCain? How dare he? Yet the media continues to blab almost exclusively about 'Donald Trump'...ad nauseum, imho. Well, he makes good copy since there's little he won't dare to say, consciously or unconsciously, and so we must see if his campaign survives until 2016 Election Day given his blurts and wild accusations, a karmic self-undoing. If he continues, I suppose his candidacy will be worth at least one more blog post, won't it? And here is Part Two of the Horoscope of Donald Trump.